Messaging hierarchy provides clarity. It explains who you are, what you stand for and what your target audiences can expect. Do your people find it hard to explain who you are and what you do? Is it tough to describe why someone should choose you instead of others in your category? Or do your introductions sound like your competitor’s? Even when the visual brand (logo and graphic elements) is clearly recognized, the verbal brand is often confused, inconsistent or missing. With strong messaging, the verbal brand will inspire response after an introduction. Or clearly differentiate what you offer from others in your category. A strong brand promise is more than a tagline. It's focused on your promise to your audiences. What can your customers or clients count on from you? Messaging hierarchy adds context to the brand promise. It defines what you're known for, what audiences recognize as your "wow!" It's then connected to how you want to be perceived and remembered. This chart is the reference for written communications. Once established, messaging guides the verbal brand. It helps leadership and team members speak clearly about the benefits of what you offer, rather than just describe a list products or services. Cascade Employers Association achieved recognition when messaging was crafted and then brought to life on business cards, posters and the website. Johnson Glaze & Co., CPAs separated their accounting services from others with messaging to emphasize both their proficiency and their personalities. Job Growers, Inc. based their new brand identity on the name and messaging hierarchy. Their board members can now quickly identify their purpose and scope of services. Messaging hierarchy blends positioning—defining a niche and purpose—around specific audience benefits. It can be adjusted and revised for different target audiences. And it can guide a new internal communication program or external marketing. Messaging hierarchy can be created on its own, as part of a rebrand, or as the foundation for a new name and new brand. Read more about messaging and its applications on our blog. 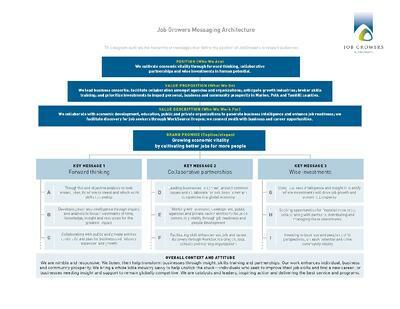 Download our positioning worksheet below to establish the context for your messaging. Or drop us an email to request an initial discussion of your objectives.